The Ballard Parking Communication and Education Program was initiated in the Spring of 2017 by the Ballard Alliance and the Seattle Department of Neighborhoods. The program's goal is to help alleviate the crowded, over-capacity parking conditions in Ballard's residential and commercial core through enhanced signage, way-finding, educational tool development, and strategic marketing. Additionally, the Ballard Alliance worked with Seattle Department of Transportation (SDOT) to review all existing way-finding parking signage throughout the BIA and identify areas where additional signage is needed. In 2018, SDOT removed all way-finding parking signage and replaced them with updated signs and added signage throughout the neighborhood. Finding parking in Ballard can be a challenge in the core business areas, especially during the evenings and weekends. We encourage you to use and share the interactive map on our GET HERE page to help you, your guests and customers identify parking options throughout the core. One particular location that many are not aware of is the Swedish Parking garage has covered public parking available and the Banner Bank parking lot offers convenient access to shops and restaurants. In addition to the parking map on the GET HERE page you can filter the map to show you bike parking options and bus stops. Please invite your friends and neighbors to join us in Ballard Commons Park Saturday mornings in June! The Ballard Alliance has created a lineup of fun activities throughout the summer in the park. To kick off our Summer in the Park series we are getting ready for the beach. Our first free class will be led by We Yoga Co. Grab a friend, bring your towels, water and mat and head over to the Ballard Commons Park for some namaste to start your day on Saturday, June 9th at 10 a.m. All ages and levels of experience are welcome to join the class. Mark your calendars for Saturday mornings in June from 10 a.m. to 11 a.m. for an outdoor fitness class. SATURDAY, JUNE 9th from 10 - 11 a.m. - Yoga in the Commons with We Yoga Co.
SATURDAY, JUNE 23rd from 10 - 11 a.m. - Yoga in the Commons with We Yoga Co. The fitness classes are just the beginning of our Summer in the Park series. More fitness and other program offerings and details will be shared soon but please plan to join us for: Movies in the Park and a Dog Show throughout the summer months. And of course, Ballard SeafoodFest! Ballard Commons Park will transform into the Ballard Market Kids Deck on July 14 & 15th. Illumination Learning Studios has worked hard to help us create a really great lineup of performers, activities and events. This project is funded in part by a Neighborhood Matching Fund award from Seattle Department of Neighborhoods . Practice your patience while Seattle Department of Transportation (SDOT) crews work to improve pedestrian and bus safety around 15th Ave NW and 53rd Ave NW for the coming weeks. Construction is expected to take six to eight weeks to complete and work is underway. SDOT crews will be installing several safety and transit improvements including: curb ramps on all four corners of this intersection, a pedestrian signal, pedestrian islands, crosswalks, and a bus only lane. 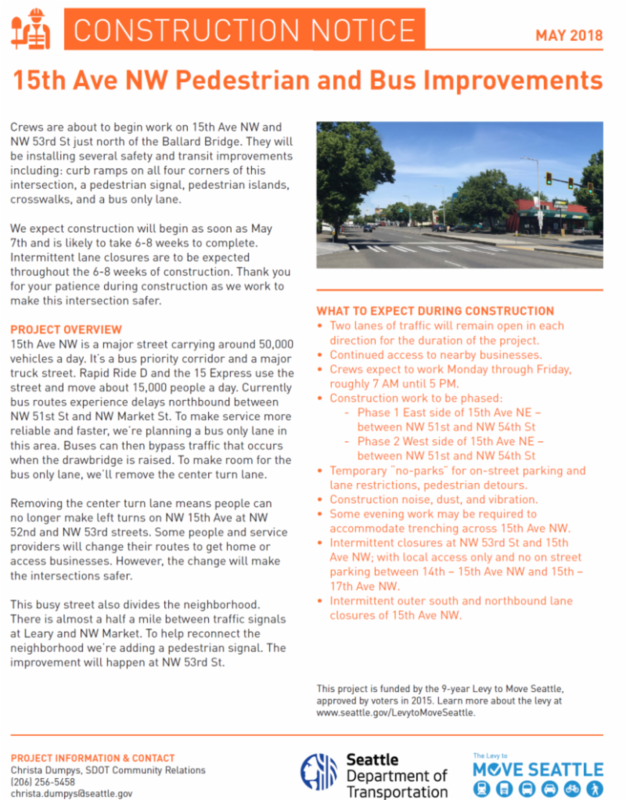 For more details about this project please read the SDOT construction notice. Another project in the neighborhood that is almost complete is at 20th Avenue NW and Leary Avenue. The project's intention is to increase walkability, safety and predictability at this intersection with the installation on an all-way stop and painted curb bulbs. Would you like to know how to become more involved in the Ballard community? Become a part of the Ballard SeafoodFest crew as a 2018 volunteer! Bring the team (you may wear clothing that represents your company/organization/brand) or a friend and see why people sign up year after year to volunteer at Ballard SeafoodFest. We would say it is for the complementary Alder-smoked salmon barbecue dinner that we offer but rumor has it they come for the fun and great people they meet. Some of the spots fill up quickly so find your desired slot and sign up today! A really exciting event is back again in the heart of Old Ballard Avenue Historic District, the 25th Annual Ballard Criterium (Ballard Crit). Cyclists race around the half-mile course that begins at the corner of Ballard Avenue NW and 20th Avenue NW ad runs down NW Dock Place, then up Shilshole Avenue NW and NW Vernon Place and then back down Ballard Avenue for an exhilarating ride. This is a fun event to watch for all ages from the sidelines or from a restaurant along the route. The first race begins at 1:30 p.m. with the Junior category and continues throughout the day with other categories and ends with the Men's Pro-category race at 7:30 p.m. Please be aware of the road closures during this time of day and plan accordingly. To find alternative parking/transportation options in the area use the interactive parking map at visitballard.com/GetHere. This is an event you don't want to miss, so head over to Ballard Avenue on June 9th and cheer on these speedy men and and women! We have found a solution to eating too much seafood at Ballard SeafoodFest. RUN LIKE A VIKING on Saturday morning, July 14th, before the festival starts! Two very Ballard celebrations are coming to you on the second weekend in July: The 44th Annual Ballard SeafoodFest and the Nordic Museum's 35th Annual Viking Days. Start your day with a run and some Swedish pancakes and finish off Viking strong with seafood, great drinks and great music. The Nordic Museum's Run Like a Viking 5K is four-legged companion friendly and costume friendly. So even if you do not have Nordic ancestry you can still look and run like one. Early registration ends on May 31st so gather your clan and sign up soon! Thank you to everyone who came out to welcome Heritage Distilling Company to the neighborhood at their grand opening celebration. It is a really beautiful space, with amazing beverage options and they are ready to share their spirits with you! Monday-Friday: 12 p.m.- 8 p.m.
REGISTER BY TOMORROW FOR LUNCH AT LAGUNITAS NEXT WEEK! Get ready, get set, it is speed networking time at a great new luncheon venue. We are pleased to share this event in the Lagunitas TapRoom & Beer Sanctuary and hope you will take advantage of this fun networking opportunity on Wednesday, May 30th from 1:30 p.m. - 3:00 p.m.
Be sure to bring a stack of business cards and be prepared to share a little about yourself and your company. We know that sometimes a minute to chat with someone is a tease so you are welcome to keep the networking going after the main program at the Lagunitas bar if you are interested. Please register for this luncheon by Friday, May 25th at noon. Copper River Salmon season is back May 18 at Ray's! This year marks Ray's 35 th anniversary serving this coveted seasonal fish. Starting in 1983, Ray's was the first restaurant in Seattle (as well as in the lower 48 states) to serve Copper River King Salmon to guests! Continuing into the 90s, when they partnered with Alaska Airlines on its "First Fish" cook-off events, Ray's celebrated each season with its signature Copper River Salmon and Oregon pinot noir pairings. And now, the restaurant brings guests the very first fish of the season by working directly with local Alaska fishermen.